These look so pretty spread out on a platter or on a tiered dessert stand. 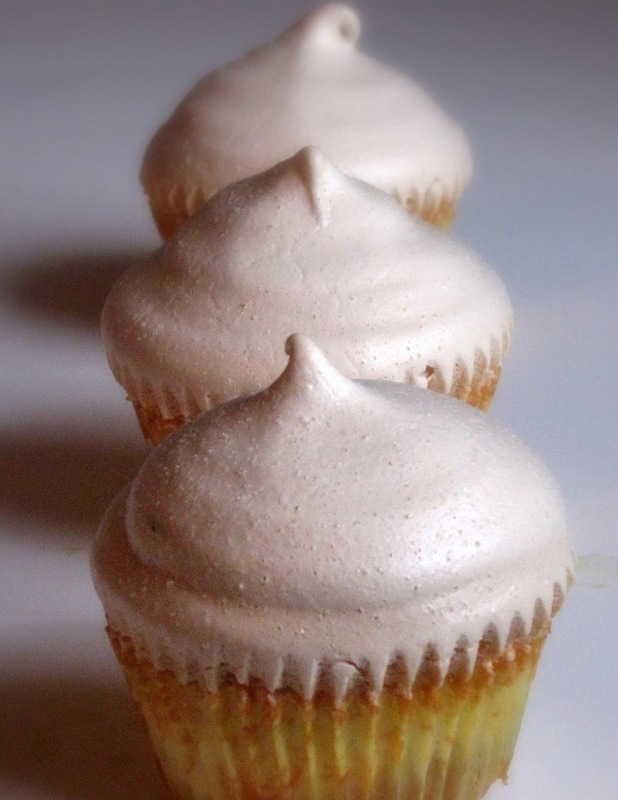 The cupcake is actually entirely meringue and there is no actual cake. Meringue is considered a "low-fat food" and these are the cutest little desserts that can be topped with anything. 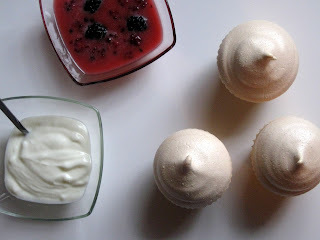 I topped them with a blackberry sauce but you could use raspberries, strawberries, or even lemon curd, whatever you think would be delicious! And, they can be colored to go with a theme! :) Themes make all food more fun, yes? Fortunately, or unfortunately meringues are something that I can just eat bunches of because they're so light and crisp and melt in my mouth. The thing to note with these is that the bottoms bake up so the top looks like frosting on a cupcake but the insides are still soft and slightly sticky and do not go all the way to the bottom of the cup. I didn't want you to expect to be able to peel them like a cupcake and take a big bite (like I did) because once you peel the paper then it starts to crumble a little. The original recipe tells you to cut off the top (on the lines of the cupcake paper) and I sort of successfully did it with one but it cracked a little on one side (not to bad). The problem was that once I opened the top there wasn't a really nice surface for putting the yogurt and sauce on, so really I prefer to break it up in a bowl and top it with the yogurt and berry sauce then eat away. The original berry sauce recipe calls it a curd but mine for whatever reason didn't thicken like a curd, even after refrigerating it. But, it is delicious and so I'm calling it a blackberry sauce :). So these little cuties are super easy to make but bake for a long time so they do require some pre-planning. I would also serve them on the day that you make them just so that can be as fresh and crispy as possible. 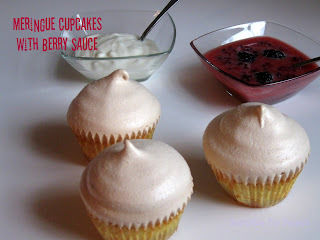 The original recipe called for serving them with crème fraîche so feel free to go that way if you would like too but I used nonfat plain yogurt to complement the sweetness in the cupcake and the sauce and found it to be lovely. Happy Baking! 1. Preheat oven to 225 degrees F. Line every other cup of a nonstick 12-cup muffin tin with baking cups; coat with cooking spray. Whisk egg whites, vinegar, vanilla, and salt with a mixer on medium-high speed until frothy. Add the sugar, 1 tablespoon at a time, beating for 1 minute after each addition, making sure the sugar dissolves. Beat until stiff, glossy peaks form. Mix in 6 drops food coloring. 2. Transfer mixture to a pastry bag fitted with a plain coupler (no tip), and pipe into prepared baking cups, about 2 inches above rims, finishing with a peak in the centers. Bake, rotating halfway through, 3 to 3 hours and 20 minutes. (Cupcakes should be completely dry on the outside but still soft in the middle. A toothpick inserted horizontally at base of top should have moist but cooked crumbs attached.) Transfer cupcakes in baking cups to wire racks; let cool completely. 3. 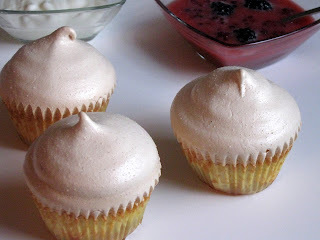 You can place the “cupcakes” into small bowls or on small plates and use a spoon to break them or carefully slice off tops of cupcakes using a serrated knife. (Run the knife just above the liner and slowly work your way to the center.) Top each cupcake with 2 tablespoons blackberry sauce, a few blackberries, and 2 tablespoons lowfat yogurt. Replace tops, and serve immediately.